After dinner with friends at Stoney’s Kingfisher in Solomons Island we had a cold, but quiet night at anchor just up past Zahnheisers. Stoney’s crab cakes were not what they used to be. with no lump crabmeat they were only good, not great. We left in calm conditions round 8 this morning. Winds rose to 18-25 out of the southwest. 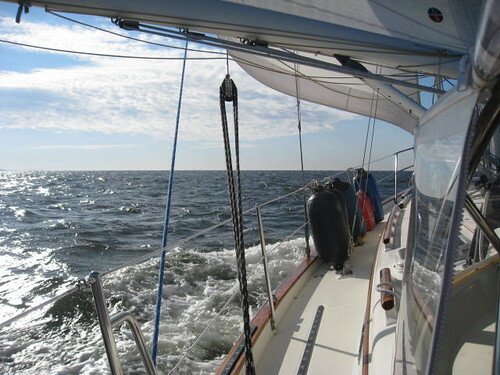 We sailed close hauled with full main, staysail and engine through nasty chop as we passed the mouth of the Potomac. We had planned on getting past the Rappahanock today, but the course change at the Potomac put us dead into chop that dropped our boatspeed to 2 knots at times, so Reedville looked good. We are anchored in 9 ft of water and seeing gusts to over 20 knots, a good test for the new D400 wind generator. This was a day that made us thankful for a boat with comfortable motion and a full enclosure. The spray was over the dodger! Tonight is a pizza party on Onward.